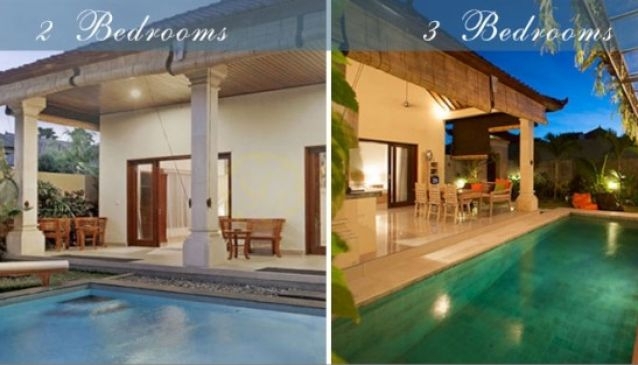 Esmee Villas is in the middle of Seminyak-Oberoi area. Only 25 minutes' drive from Bali Airport and close to some of the most popular restaurants in this famous area, such as Mykanos, Rumours, Red Carpet, Ultimo, Kaizan. Experience the never ending shopping galleries and spas along the famous Eat Street, just a short distance away. The outdoor living area is close to the dining area and a full kitchen. Also 42″ LED TV with satellite channels and stereo system. Two (2) Bedroom Villa - Villa Esmee - 2 fully air-conditioned bedroom sleeps 4 adults. Featuring 2 queen size beds, private bathrooms overlooking private swimming pool and tropical garden. Three (3) Bedroom Villa - Villa Esmee - 3 fully air-conditioned bedrooms, sleeps 6 adults. Featuring 3 king size beds, en-suite bathrooms overlooking private swimming pool and tropical garden.